Rearsets were originally the preserve of racers who wanted higher-mounted footpegs for greater ground clearance. But they’re also the best way of tailoring your bike to fit you perfectly, by raising, lowering or moving the pegs backward or forward. Most have mounting plates with several positions for the footpegs to bolt on to, so every length of leg can be catered for. Essentially you’re replacing your bike’s boring, standard issue blobs of cast aluminium for more ornate, machined-from-billet footpegs, levers and shift rod on the gear selector knuckle joint. Individuality and style come with rearsets, but they ain’t cheap for bolt-ons which always get scuffed, even in a low speed spill. Allen keys, sockets and a couple of hours of manual labour are alien concepts. A rear paddock stand, a socket set (8-17mm minimum), combination spanners (8-19mm), screwdrivers (Phillips and flat-bladed), Allen keys (4-10mm), baby Stilsons (like a pipe wrench), thread glue (Loctite), some lightweight grease and a tape measure. Like all do-it-yourself jobs, threads can be stripped or components cross-threaded if you rush it. The key is to take the time to do things properly and make a careful record of which bits go where. All you need is a bit of common sense, two hands and the ability to follow instructions. It’s really a lot easier to fit rearsets than you might think. 1. 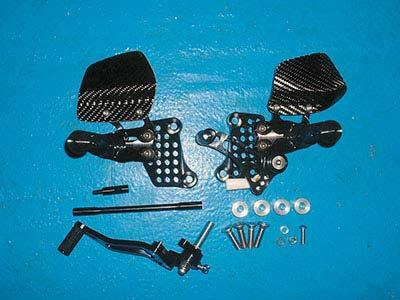 Check the packaging and invoice to see the rearsets are for your precise year and model bike. When ordering, remember to ask if they come with the facility for rear brake light operation – as they’re designed primarily for race use they might not have the associated brackets. A lot of people don’t worry about such trivial things. 2. 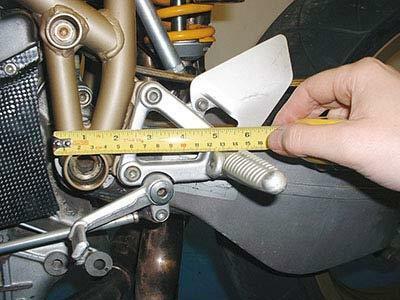 Before removing the original footpegs, measure where they sit – by using various points on the frame you’ll get an accurate position. This helps set up the rearsets: the stock pegs might be at the right height but need moving backwards. 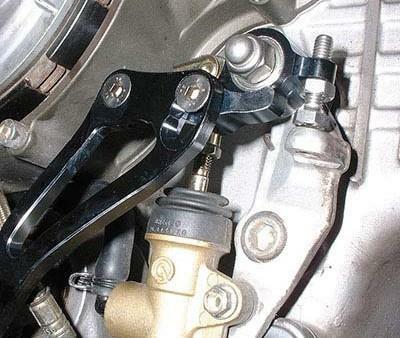 Adjustable rearsets cater for this and with a measure as a guide it won’t take long to sort out. 3. Start with the gear selector side. If a new, longer shift rod is used remove the original rod first. It’s best to remove the knuckle joint of the gear selector shaft first. Check that the shaft has a dot-punch mark where the knuckle joint split is located. If there isn’t one make one with a hacksaw or felt tip. This ensures it goes back on correctly. 4. 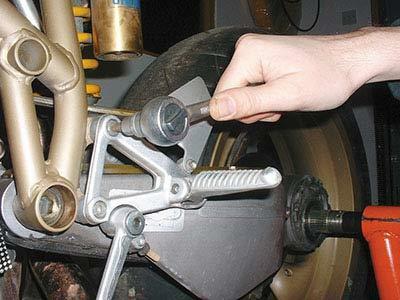 Loosen the knuckle joint’s retaining bolt then undo the two locknuts at either end of the shift rod. Remove the knuckle joint bolt then pull it off the splined shaft and unwind it free of the shift rod. Now unwind the shift rod from the gear lever. Remember that this end is more often than not a reverse thread (clockwise to undo). 5. The footrest hanger can now be removed. Extreme care is needed here because the mounting fasteners may be Loctited (non-setting glue) in place. You might need an extension bar, or long piece of tubing slipped over the ratchet or Allen key, in order to get greater leverage. 6. Fit the new hanger into place. 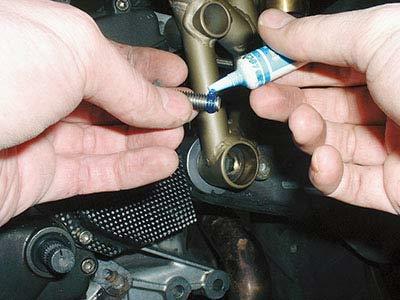 If new bolts are supplied, use Loctite on the threads. If old ones are re-used there’ll be ample glue left on the bolts. 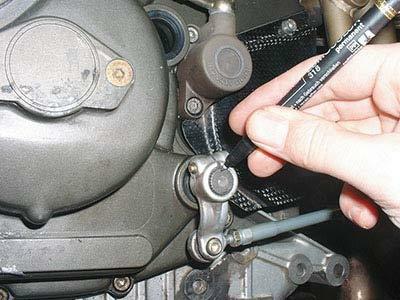 Get your measure out to establish which footpeg-mounting hole is closest to the original position, then mount the pegs higher/lower/further forward, according to your personal requirements. 7. If the new gear lever fits directly on to part of the new footpeg then grease it up before assembling it in place. 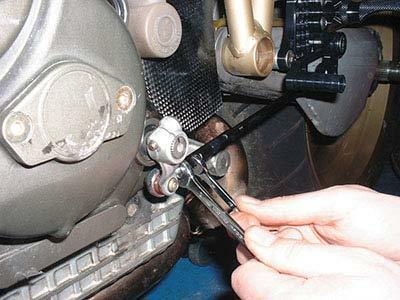 If the footpeg is held in place with a bolt from the rear, use the baby Stilsons to hold the peg in place while tightening its mounting bolt. 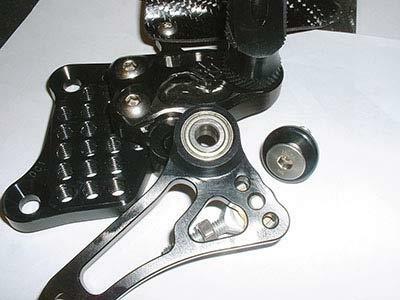 The rearsets shown above have roller bearings on the pivot and don’t need greasing. 8. Fit the new shift rod to the gear lever so all the thread is used up. 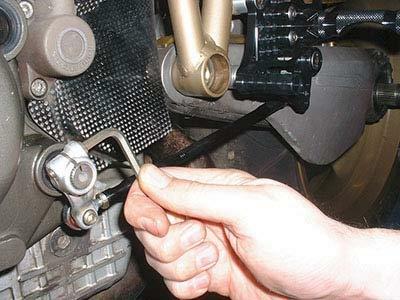 Attach the original knuckle joint to the shift rod, again using all the thread – do not tighten the locking nuts yet. Fit the knuckle joint back on the shift shaft. If the gear lever is in too extreme a position rotate the knuckle joint to get the lever in roughly the right place. 9. Winding the shift rod up or down on its threads sorts final positioning of the gear lever. 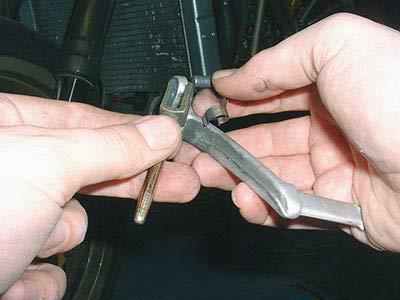 Once in the right position, tighten the lock nuts on the rod. Ensure the knuckle joint’s retaining bolt is tight. Check all gears can be selected by moving the lever by hand while turning the rear wheel. Check nothing interferes with lever movement. 10. Brake side removal is similar to the gear side. The adjuster part of the brake is the threaded bar from the rear brake master cylinder. To remove this you have to undo the clevis pin joining the lever to the threaded bar. 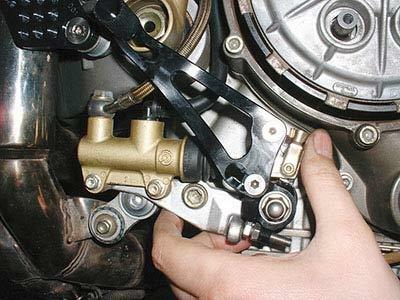 If the master cylinder is bolted to the hanger then remove it before removing the hanger. 12. It doesn’t use one. There is sufficient strength in the plunger spring inside the master cylinder for the lever to return. Refit the master cylinder to the footrest hanger and refit the clevis pin. 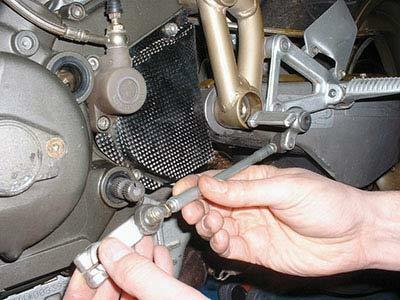 Adjustment is via the threaded bar – undo the two locknuts and turn the threaded bar right or left. Tighten the locknuts. Job done.